Cheez Whiz brand is a popular name with most American families that defines a cheese sauce and spread. Cheese Whiz is manufactured by Kraft Foods Limited. In the early 1950s, a team of scientists who specialized in food products led by Edwin Traisman came up with Cheez Whiz and they introduced it into the market in 1952. Since then, Cheese Whiz has developed into one of the most popular toppings for food and snacks, with greater market shares in the United States, Canada, Venezuela and the Philippines, as well as Mexico in South America. Kraft Foods is responsible for marketing in all these areas and the products come as a paste, bright yellow in color and packed in a glass jar. The product comes in a variety of sizes with two popular jar sizes and shapes being the narrow tapered on the base and a large cylindrical shape. Cheez Whiz is categorized as among the top brands of processed cheese foods with over one million USD of revenues collected and this is greatly attributed to its ingredients. The main ingredient is regular cheese, which is stabilized with emulsifiers and agents such as carrageenan and xanthan gum. 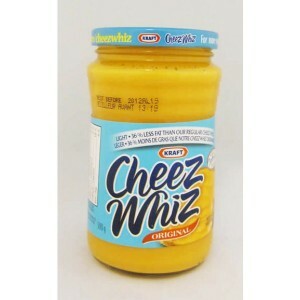 Other ingredients include annatto, which is mainly for coloring and citric acid used to enhance Cheez Whiz’s tanginess. There are a number of varieties available in the market for Cheese Whiz. They include Salsa Con Queso, which is marketed in the United States, and Tex Mex Jalapeno popular in Canada. Because of its brand name, Cheez Whiz campaigns have used fancy slogans that have been well accepted and in some area, such as Philadelphia, Cheez Whiz is popularly referred to as “Whiz Wit” in short.